Mountain forests in the Alps react very differently but noticeably to a warmer climate. Even if the target of limiting the Earth’s average temperature increase to 2 degrees were met, this would already prove too much of a challenge for some mountain forests. This is the result of computer simulations by researchers at ETH Zurich. For this reason, the scientists are proposing adaptation measures. In densely populated Europe, mountain forests are not only areas of recreation for tourists and the local population. Above all, these ecosystems provide essential services for people and for nature. They provide wood, bind the greenhouse gases carbon dioxide and methane, absorb precipitation and form natural protective walls against rockfall, avalanches and other natural hazards. Under the leadership of Harald Bugmann, Professor of Forest Ecology at ETH Zurich, researchers have used computer models to examine the extent to which, and speed at which, services derived from mountain forests are projected to change when the climate heats up. For the first time, climate scenarios were used that show how climate change would affect Switzerland if it were possible to restrict global warming to an increase of 2 degrees above pre-industrial conditions by the year 2100. 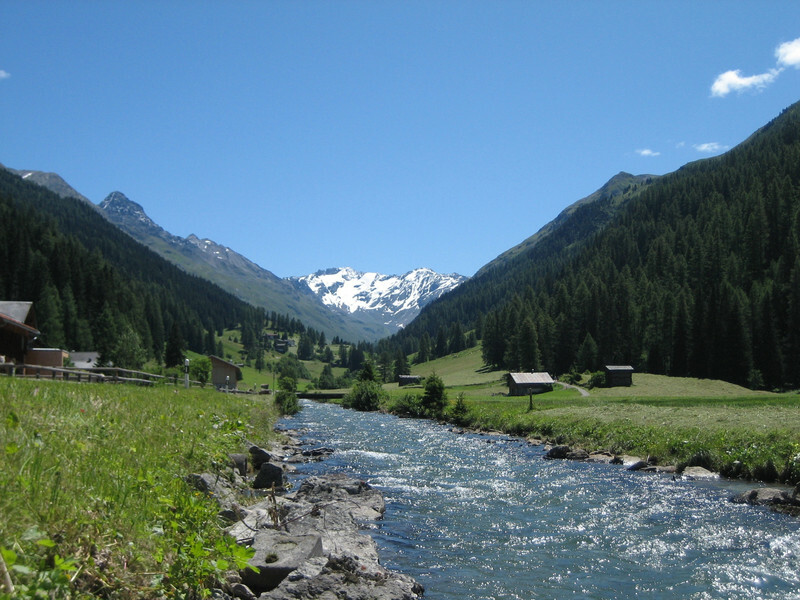 The researchers used different climate scenarios to simulate the development of mountain forest ecosystems in two very different Swiss mountain valleys: the development of the dry inner-alpine Saas valley in Upper Valais with an elevation range extending from 600 metres to 4,390 metres above sea level, and of the Dischma valley in the Grisons, which is cooler and damper and has an elevation range of 1,500 to 2,800 metres above sea level. The researchers used three forest models to evaluate a total of five ecosystem services along elevation transects. With the simulations, they examined the impact of the climate scenarios on the following key services derived from mountain forests: the storing of carbon, the influence of vegetation on runoff, the diversity of the forest, wood production and the protective functions the forests provide against avalanches and rockfall. The climate scenarios used in the simulations are based on non-intervention or low-intervention measures and on a stabilisation scenario. The latter involves halving the current level of greenhouse gas emissions by the year 2050 and meeting the international climate policy objective of curtailing the increase to 2 degrees compared with pre-industrial values by 2100. In addition, a further scenario was used which includes larger monthly fluctuations – for example in precipitation – and thus allows the impact of short-term variability to be examined. Unlike the three other scenarios, this scenario is not based on the mean values of what are referred to as “ensembles” (several model calculations), but on a single regional climate model. The simulations show that certain ecosystem services are reasonably robust to moderate climate change. For example, this applies to the storing of carbon in vegetation biomass at the level of the entire valleys. By contrast, the impact on other services is clear for both valleys, but very different in each case. The Saas valley, which is already dry today, is worst affected. According to the models, its ecosystems will exhibit strong changes even under the 2 degree scenario. «An increase in the global average temperature by more than two degrees would have far-reaching and serious consequences», says Harald Bugmann. According to Bugmann, the extent of the impact would depend on the current climatic and ecological situation, and on the topography of the valleys. In both the Saas and Dischma valleys, the protective functions that forests provide against rockfall and avalanches would decrease more sharply at low and intermediate elevations depending on the scenario, but would increase at elevations above 2,000 metres above sea level, where higher temperatures would promote forest growth. Depending on the climate scenario, however, in the Saas valley this would just be a temporary trend that would reverse again over time with increasing dryness. «With our study, we are examining for the first time what an average global warming of two degrees Celsius and more would mean for forest ecosystem services at a regional level », says Ché Elkin, first author of the study and senior research associate to Harald Bugmann. The researchers acknowledge that the complexity of the mountain forest ecosystems makes it difficult to forecast precisely how the vegetation would react to climate change. The results of the simulation are subject to uncertainty and have to be interpreted with caution, they say. However, because even a 2 degree target does not safeguard the current services derived from forest ecosystems in mountain areas, the researchers are of the opinion that adaptation measures are needed, particularly in the parts of the Alps that are already dry. «For example, forest management and thinning at low altitudes could help alleviate drought; but we also have to consider changing species composition, to the extent of bringing in drought-tolerant species that are currently foreign to the region», says Bugmann. The scientists obtained the ensembles climate scenarios from the Center for Climate Systems Modeling (C2SM). These are the «Swiss Climate Change Scenarios» (CH2011, see CSCS 30 September 2011) developed by Swiss researchers using the Fourth Assessment Report from the Intergovernmental Panel on Climate Change (IPCC). The additional regional climate model stems from the EU project «Assessing Climate Impacts on the Quantity and Quality of Water» (ACQWA).